The Bradford Hotel01274 734734work01274 306146fax HotelOffering excellent transport links, The Bradford Hotel is located in the heart of the city and is the perfect base for both leisure and business travellers alike. Flexible spaces and state-of-the-art facilities make it the ideal venue for corporate meetings, social gatherings or special occasions. Our stylish guest rooms, professional services and host of amenities ensure a memorable and productive stay. 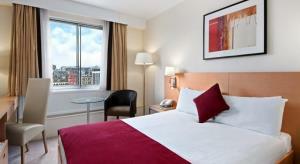 Feel at home in our modern and relaxing guest rooms, featuring large windows with some offering city views. Select from 30 different channels and 100 on-demand movies, available on the 32" flat-screen TV. Catch up on work at the desk and stay connected with high speed wireless internet. Upgrade to a Deluxe room and benefit from special touches such as a complimentary bathrobe, slippers, wine, mineral water and individual cakes, in addition to high speed wireless internet and all the facilities provided in the standard guest rooms. Our inviting suites include a separate dining area and offer city views. Enjoy extras such as bathrobes and slippers as well as complimentary wine, mineral water and mini cakes. Get to work at the large desk with high speed wireless internet. Sample freshly prepared meals in this stylish restaurant overlooking Bradford City Hall – famous for our large Yorkshire pudding dishes. Please note that pre-theatre dining is available on request. The Bradford Hotel is centrally located and enjoys excellent links to the Bradford Transport Interchange, just a two-minute walk away. Leeds/Bradford International Airport is seven miles away and the M62 is close by, making it easily accessible for Guests travelling from any destination.